The initial furore over Pinterest finally seems to be simmering down a little, although they are still having to space out the memberships due to high demand. It is also still the fastest growing social network EVER. However, what use is it to the average small business? This post will take you through the basics of how to use Pinterest to market your business, regardless of how boring you consider your business to be perceived by the masses. Pinterest is about sharing (pinning) the things that you think look nice; this could be things in your house, clothes that you want to buy, your dream house, places you want to visit, your favourite cereal packet etc etc. it could also be your favourite business video, could be a talk on global warming, any video or image. So once you have been accepted into Pinterest, what should you do with it? 1) Decide what you are going to promote on there. If you are a fashion business, a photographer or an artist then this is very obvious but what if you are a company that does not produce or sell anything visually pleasing? What if you sell whiteboards? The trick is to think broadly. When I was thinking about what I could do with Pinterest for Deep Footprints I first started looking through the categories that are most relevant to my business to see what others were doing. This image shows the broad choice of categories available to you to have a look in for similar content to get some ideas about what you may be able to add to the mix. Another good idea is to take a look at what is popular on Pinterest; There is a “popular” tab at the top next to the categories and videos. Find what is being commented on, liked and re-pinned the most? These are the 3 core behaviors available to the Pinner. When you see something that you like within Pinterest you can re-pin it to one of your boards (will explain in a sec), like it (you use Facebook right?!) or you can comment on it (again, obvious). 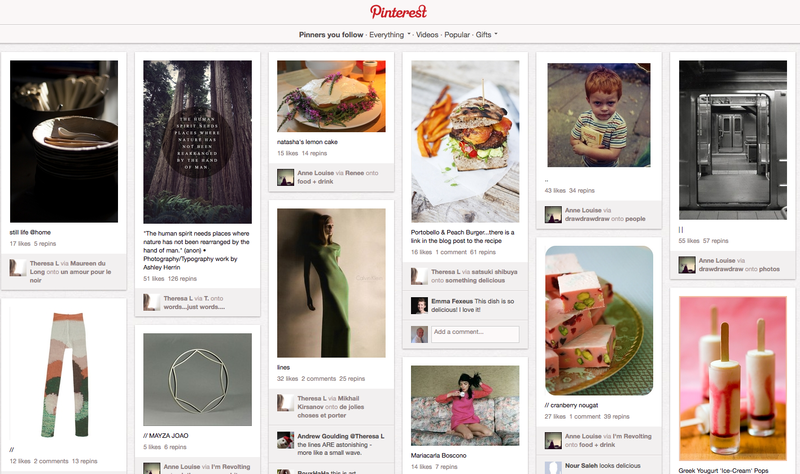 All users in Pinterest are given 5 boards as default, which all have a given theme. The first thing that you should do is to edit these boards to be focused on themes that fit your business and that you feel will interest others. For Deep Footprints I decided to do a few on marketing infographics as they are a great way to visually disseminate information relevant to my business, my peers and my clients. I also decided to add some boards for videos on digital marketing and finally a few more broadly related boards on marketing books and also people that I admire. It is also perhaps a good idea to humanise a business account with some fun/interesting boards that do not relate directly to your business but tell a bit about the personality behind the business. As you can see it is nice to look at but with 8000+ pins this will have taken a while to cultivate. Each board does not seem to have a limit to the number of pins that you can add – there must be a set limit but I have seen boards with 700+ items so the limit is not something that you should worry about. Initially, make sure that you have 9 pins for each of your boards so that they show as fully populated when users preview your account. I still have a few with just 2 or 3 pins and it looks half hearted – mental note to get that done. One thing that Pinterest do quite poorly I think is that when you first sign in you are given some suggestions of people to follow; all of these are just the most followed people on Pinterest so they each have massive followings and it is difficult for others to break into this elite group. There should be a bit more intelligence behind this technology to make it more of a democratic society – e.g. relevance to your profile text as well as most comments/Likes/repins per posted pin. e.g. If you have pinned 100 items and have 200 shares then you are stronger than someone who has pinned 1000 items and received 300 shares. Now you have some Pinboards how do you add content? To add a pin you need to insert the URL of an image or a video file – if you put in the URL of a web page it will allow you to select the image that you want from all of the images on that web page. To upload a pin you simply select an image or video file from your computer, and creating a board is self explanatory. 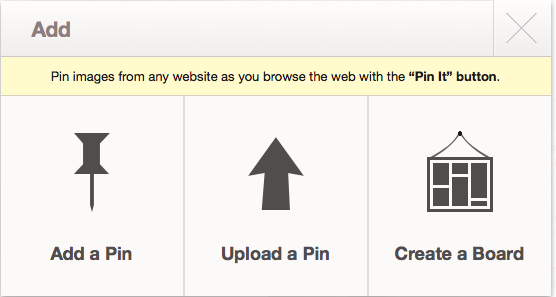 When you add a pin the URL of your web page is linked to from the pin; these links are do-follow links by the way. 2) Use the Pinterest browser button – this is a tool that can be added to your bookmarks toolbar in Firefox or Chrome browsers (and perhaps IE too??) From this you can simply hit the button whenever you are on a webpage that you want to add an image from, a Pinterest pop up will appear showing all of the images on the page and you will then be able to select the image from the page which you want to add. However; i have found that uploading videos in this way fails – it may be a bug, I am not sure? Therefore I always upload videos using the Youtube URL of the video. When you pin items using the browser button a link to the web page that you added the image from is also included on the pin – again it is a do-follow link. 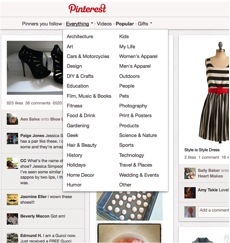 3) Re-pin content that is already on Pinterest. This is quick and easy – you simply find the items through browsing that are relevant to your boards and hit the “re-pin” button. 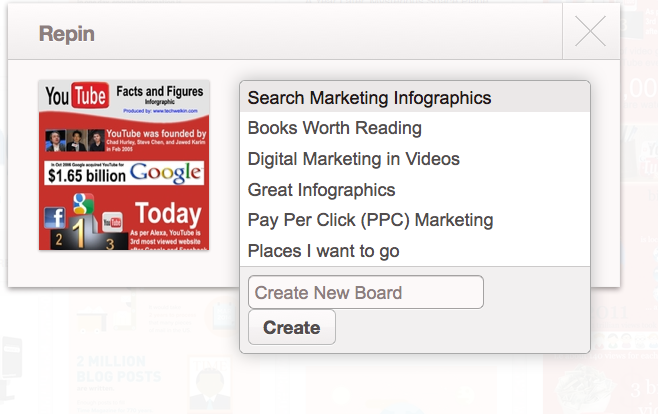 You then select the board that you want to re-pin to and job done – it is posted to your board; of course this way you do not get any direct SEO benefit as there is no link back to your site, however, having a board full of great content brings it’s own level of Kudos so do not be shy about re-pinning others pins. An image of this is shown below. An important thing to remember whilst you are going pin crazy trying to make the most incredible and beautiful resource on the net is that this is a social network; talk to other pinners about the things that they have pinned, like them and build relationships. Pinterest is a great example of a site bringing like minded people together – it is more easily done with visual apparatus. Digital marketing and SEO in particular are becoming more about relationship building and connecting with the recognised experts in your field and helping to lead the field forward. If you sell products that you can show directly on pinterest (fashion, art, design, houses, jewellery, glassware etc etc) then you can use Pinterest to understand the kinds of things that interest different people; you can look at other items similar to the ones that you sell to see what is being re-pinned, commented on and shared. This will help you to direct your product development and buying decisions as well as merchandising if you are a retailer. But I sell Whiteboards, are you going to tell me what i can do with Pinterest? OK, alright – what are whiteboards used for? The sharing of ideas and knowledge. Therefore you could theme your Pinterest account and many of your boards around this. You could share videos from TED and other idea forums, you could have a board on the worlds greatest entrepreneurs, you could show images of whiteboards with plans on them, your company hierarchy etc etc. Whatever your business you could have boards of photos of your staff members (perhaps in an inebriated state at the xmas party) or you could have photos of your office and how it is laid out and why. Actually that last idea sounds pretty boring unless you do have a spectacularly designed office…. The idea is to think creatively about your business; why are you working there? what makes you passionate about it? How can this be visually represented? How could you visually portray the solutions to your customers desires? That ‘popular’ acct you mentioned, Theresa L, is a known nutter and fraud. It won’t be long before she comes unstuck!